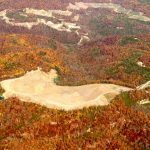 The Obama administration has approved a petition from Tennessee to designate some 75,000 acres of mountain ridges off limits for surface coal mining. The move protects mountain streams, wildlife habitat, scenic views and eco-tourism assets of the iconic Cumberland Plateau. But other mountains in Tennessee are still threatened with mountaintop removal mining. Take action today.